The first shot I hit with the Hot Launch Iron-wood from Tour Edge Golf was from a packed sandy lie and, as with any club for the first time, I wasn’t sure what the result would be. Understandably, there was a certain lack of confidence even if I made a good swing, but I shouldn’t have been worried. The ball came off the 18-degree Iron-wood with a medium trajectory (tough to do from a bare lie), a very slight left to right movement and about the distance I expect from a hybrid of that loft. For the remainder of the round, from the fairway (usually), Bermuda rough and even a long shot to the green from a fairway bunker the ball flew high and landed soft…just as you want. Tour Edge has made several versions of the iron-wood over the years including the very well regarded models of the Bazooka series so it wasn’t really a surprise when this latest version did as advertised. Over the following nine rounds the Iron-wood became a trusted friend that could be relied on to get out of most any trouble and a real help on long par-3s since the ball pretty much stopped near where it landed. The Hot Launch Iron-wood is worth consideration by anyone looking for a new set of game-improvement category hybrids and irons since lofts range from the 2-iron replacement 18-degree I tested all the way to a 59-degree lob wedge. And the pricing is comfortable as well–$80 per club or $500 for a seven club mixed set. 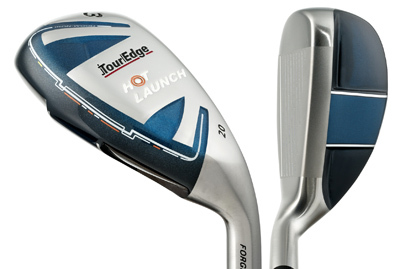 Tour Edge makes the Iron-woods with a hollow head construction and a thin, variable thickness face of forged maraging steel. I felt a big part of the inherent “hit-ability” though was the heavy sole weighting which not only helps the ball get in the air but also produces a very solid feel. So, my recommendation is, for anyone looking for game improvement hybrids and irons to “test drive” the Iron-woods from Tour Edge. In particular ladies and seniors or in fact any player with a slower swing speed can really get some help from these clubs.